Unusually for pioneer British diesels, 10201 and 10202 were originally specified (prior to alteration of gear ratios to improve tractive effort when operating as mixed-traffic units) with a top speed of 110 mph (180 km/h) rather than the 90 mph (140 km/h) of 10203, pre-dating the three-figure maximum speeds of the Deltic and Class 50 designs by some years. Percy Bollen's bogie design and the power train of 10203 were taken almost unmodified for the first ten production British Rail Class 40s but with a more traditional English Electric design of body with prominent noses and louvred side panels. 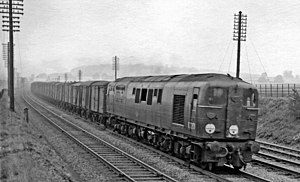 The original locomotives, numbered 10201 and 10202, worked services on the Southern Region of British Railways. They were transferred to Camden depot in the London Midland Region in April 1955. Number 10203 was outshopped from Brighton works in March 1954, its modified engine giving a power output of 2,000 hp (1,500 kW). It was trialled on the Southern Region before joining its sisters on the London Midland, being allocated to Willesden depot. All three locomotives were non-standard with regards to spare parts and servicing and they were withdrawn at the end of 1963. After spending some time on the scrap line at Derby Works they were eventually scrapped at Cashmore's at Great Bridge in 1968. ^ "Brief Biographies of Major Mechanical Engineers". Steamindex. Steamindex. Retrieved 11 February 2017. Strickland, David C. (September 1983). Locomotive Directory: Every Single One There Has Ever Been. Camberley, Surrey: Diesel and Electric Group. pp. 27, 29. ISBN 978-0-9063-7510-5. OCLC 16601890. Stephens, Robert (1988). Diesel Pioneers. Atlantic Transport. ISBN 0-906899-29-X. Clough, David N. (2011). "2: Diesel-Electric Development after 1945". Hydraulic vs Electric: The battle for the BR diesel fleet. Ian Allan. pp. 19–24. ISBN 978-0-7110-3550-8. Wikimedia Commons has media related to British Rail Class D16/2.